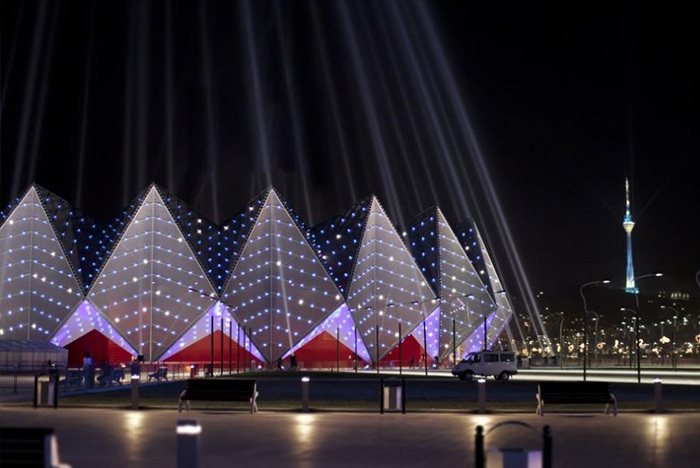 Baku's iconic Crystal Hall will be a showcase venue for the inaugural European Games. Constructed in just eight short months, the multi-purpose facility played host to the ever-popular Eurovision Song Contest in 2012. Due to the short time-span available ahead of Eurovision, the arena had to be designed and constructed simultaneously with German firm GMP Architekten collaborating closely with contractors Alpine Bau Deutschland and Nüssli throughout the process. In addition to the very small amount of available time, difficult weather and climate conditions posed additional challenges. The wet ground in particular caused a lot of headaches among the assemblers, as entire construction elements sank into the muddy surface. Conceived as both a concert hall and a sports stadium, the 25,000-seater venue comprises of a lightweight steel structure with a faceted membrane facade intended to resemble cut crystal. The arena was originally planned to be just a temporary facility, but was subtly altered during construction to enable it to remain in place for longer. Instead of the usual reinforced concrete construction, the building has been designed as a pure steel structure which consists of three independent parts; the membrane façade, the modular stadium itself and the interior roof. design and construction proceeded in parallel. A prerequisite for the success of this novel working method is the extensive experience in design, management and construction scheduling provided by the consortium, as well as very good communication between the design team and the construction companies. The characteristic crystalline shape of the building and its illuminated façade is the response to Azerbaijan's special request for the creation of a widely visible and visually effective landmark as a bridge between Asia and Europe that will be noticed in an international context. Different dynamic lighting scenarios have been programmed for the 9,500 LED lights to highlight the membrane façade and create moods appropriate for the different stages of the events. The hall is located in the centre of the Flag Square Cluster on a dramatic peninsula jutting out into the Bay of Baku. 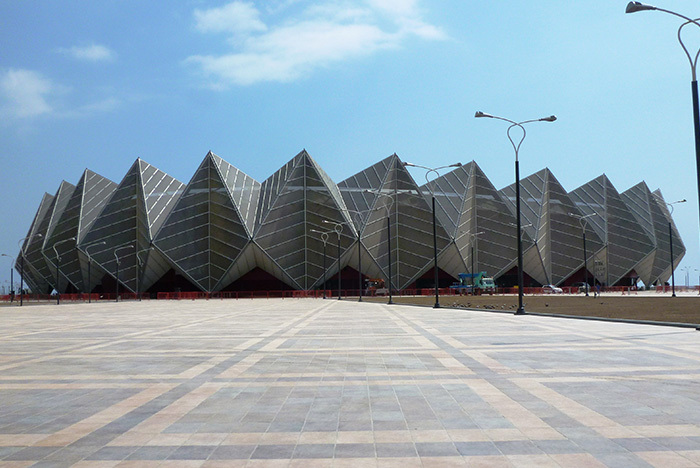 During Baku 2015 the Crystal Hall will be the home of indoor volleyball, fencing, taekwondo, boxing and fencing. With a capacity of 25,000, the venue is the third largest on offer at the European Games. Following its staging of the 2012 Eurovision Song Contest the facility has been used mainly as a music venue, hosting acts such as Jennifer Lopez, Shakira and Rihanna. It is also scheduled to host the 6th e-Sports World Championship held by the International e-Sports Federation in November 2014.